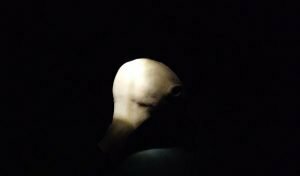 Pithos (one possible story of our lively material) presents existing and new works by artist Louise Mackenzie, following a three-year period of intense research within the laboratories of the Institute of Genetic Medicine, Newcastle University and ASCUS Labs at Summerhall, Edinburgh. Works in film, installation and participatory performance reimagine the myth of Pandora for the biotechnological era, tracing a path through Mackenzie’s personal and subjective experience of genetically modifying E. coli bacteria to store a thought within their bodies. The body of the micro-organism is commonly used as resource within biotechnology. Through the performative act of reconsidering the (microbial) body as a lively vessel, Mackenzie draws a closer connection to the living body in the context of the laboratory and in doing so, develops a subjective approach to working with life that confronts issues of care and control.